Summary: The Brevard County Environmentally Endangered Lands (EEL) Program is building four regional Management & Education Centers. These Centers serve as hubs for implementing the EEL Program land management and environmental education goals. The first of these Centers opened in 2002 in the North Region at the Enchanted Forest Sanctuary. Planning for a second center in the heart of the Archie Carr National Wildlife Refuge (ACNWR) is underway. The Barrier Island Ecosystem Center (BIEC) is scheduled to open in early 2006. The BIEC will serve as a focal point for environmental education within the Archie Carr National Wildlife Refuge. The goal of this project is to create a sea turtle interpretive exhibit for the Barrier Island Ecosystem Center. 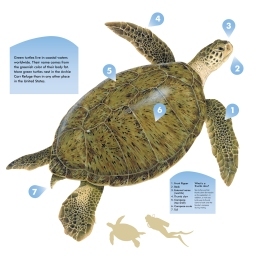 The exhibit will be part of a larger interpretive program to educate visitors about the EEL Program, the Archie Carr National Wildlife Refuge, the marine turtles of Florida, and best management practices for the protection and conservation of the barrier island, sea turtles, and sea turtle nesting beaches.